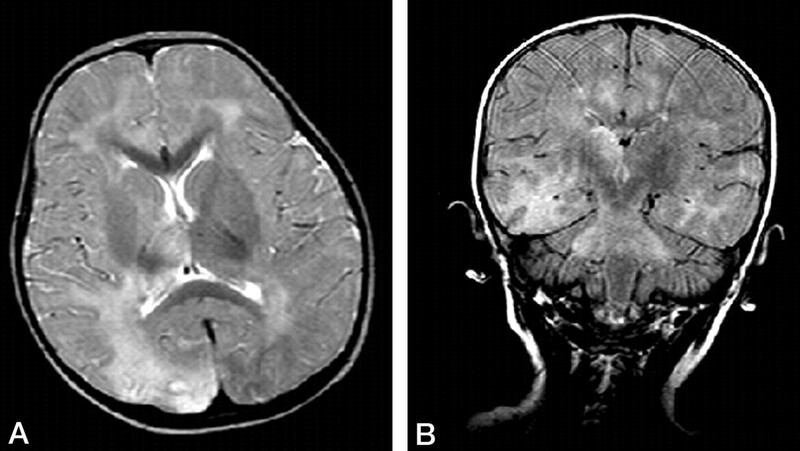 Summary: A case of subacute sclerosing panencephalitis in a 2-year-old boy is reported. In addition to asymmetric lesions in the parietotemporal lobes, right thalamus, and globus pallidus, symmetric patterns were notable in the brain stem, middle cerebellar pedincles, and dentate nuclei. Proton MR spectroscopy revealed markedly decreased n-acetylaspartate peaks and normal choline and myo-inositol levels in the lesions. Diffusion MR imaging revealed an elevated diffusion pattern manifested with high apparent diffusion coefficient values (1.14–1.60 × 10−3 mm2/s) compared with those in normal-appearing brain tissue (0.65–1.00 × 10−3 mm2/s) and subtle high signal intensity characteristics on diffusion-weighted images obtained at b = 1000 s/mm2. Subacute sclerosing panencephalitis is a progressive neurologic disorder that is considered to be caused by persistent measles virus. MR imaging findings have been described in the disease (1–4), and several proton MR spectroscopy reports exist in the literature (5–7). A recent report on acute encephalitis associated with measles included diffusion MR findings (8). In this article, a patient is reported to have not only common cerebral white matter involvement, but also thalamus, basal ganglia, brain stem, and dentate nucleus involvement. 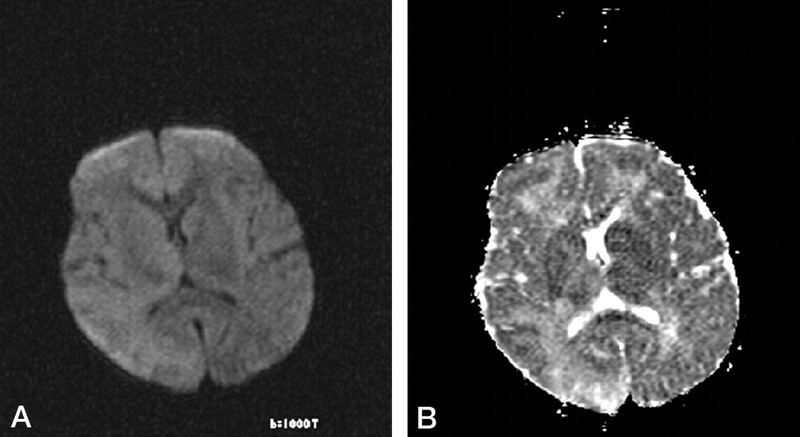 Herein we present the diffusion MR imaging and proton MR spectroscopy features in the case of subacute sclerosing panencephalitis in a 2-year-old boy. A 2-year-old boy had measles infection at age 14 months. Symptoms started with myoclonus 3 months before admission to the hospital, and pyramidal and extrapyramidal signs developed later. Seizures were noted. On admission, he had quadriparesis. On electroencephalograms, high-voltage diphasicwaves in a paroxysmal fashion were noted. An MR imaging examination was requested. It was performed on a 1.5-T unit (Magnetom Vision, Siemens, Erlangen, Germany). There were asymmetrical high signal intensity changes in the white matter and cortex of the parietal and temporal lobes. The right thalamus and globus pallidus were involved. The brain stem also had diffuse lesions as well as middle cerebellar pedincles and dentate nuclei (Fig 1A and B). Diffusion MR imaging performed with the echo-planar trace sequence (TR, 5700 ms; TE, 139 ms; b = 50 s/mm2 [T2-weighted]; b = 500 s/mm2 [partially T2-weighted]; and b = 1000 s/mm2 [diffusion-weighted]) images were studied. The signal intensity of the lesions gradually decreased from b = 50 s/mm2 to b = 1000 s/mm2, revealing subtle high signal intensity on b = 1000 s/mm2 images (Fig 2A). On apparent diffusion coefficient (ADC) maps, the lesions had high values ranging between 1.14 × 10−3 mm2/s and 1.60 × 10−3 mm2/s, compared with the values from the normal-appearing regions of the parenchyma ranging between 0.65 × 10−3 mm2/s and 1.00 × 10−3 mm2/s (Fig 2B). Proton MR spectroscopy (TR, 1500 ms; TE, 40 ms) from the lesions revealed decreased n-acetylaspartate (NAA) peaks (Fig 3). Other major peaks including choline (Cho) and myo-inositol were normal with respect to creatine (Cr). Peaks at about 1.0–1.7 ppm were evident, which may have represented macromolecules. The diagnosis of subacute sclerosing panencephalitis was confirmed by revealing elevated antibody titer against measles in the CSF and serum and elevated γ-globulin in the CSF. A, Axial T2-weighted image reveals asymmetric high signal intensity lesions in both hemispheres. Lesions in the right thalamus and globus pallidus are noted. B, Fluid-attenuated inversion recovery image reveals cerebral hemisphere lesions and involvement of the pons, with lesions extending to the middle cerebral pedincles. A, Diffusion-weighted (b = 1000 s/mm2) image reveals subtle high signal intensity at the lesion sites. B, ADC map reveals high signal intensity and high ADC values in the lesions (measuring 1.17, 1.18, 1.24, 1.49, 1.27, and 1.21 × 10−3 mm2/s). Two normal ADC values—one from the left thalamus and the other from the left parietal lobe—were 0.87 and 0.821.21 × 10−3 mm2/s, respectively. Spectrum from the right hemisphere reveals a decreased NAA peak with respect to Cr. Note that Cho and myo-inositol peaks are normal. Irregular peaks are noted at about 1.6 ppm because of macromolecules. Previous MR imaging studies on subacute sclerosing panencephalitis have reported typical bilateral asymmetric hyperintense lesions in the parietal and temporal lobes in the acute stage (1–4). In time, lesions become more prominent, and periventricular white matter, corpus callosum, and basal ganglia can be involved. Later, encephalomalacia and atrophy develops (1–4). A recent study dealing with six patients with acute measles encephalitis reported presence of striatal necrosis, hemorrhagic parenchymal lesions, and parenchymal and leptomeningeal enhancement after administration of intravenous contrast medium (8). In the present patient, in addition to parietotemporal and right thalamic and basal ganglion involvement, it was interesting to note that there were diffuse brain stem lesions with extension to the dentate nuclei via middle cerebellar pedincles in a symmetrical fashion (Fig 1), because brain stem lesions are known to be rare (4). The latency of the disease is relatively long. A recent study reporting 36 patients with subacute sclerosing panencephalitis cited that the age at onset of symptoms varied from 4 to 23 years; the average age at onset of disease was 13.1 ± 4.18 years, and the mean duration from the infection to the onset of subacute sclerosing panencephalitis was 9 years (2). With respect to our 2-year-old patient, the latency of the disease was quite short in that he had measles infection at age 14 months, and symptoms started at age 21 months. It has been reported that histopathologic examinations in subacute sclerosing panencephalitis show evidence of neuronal loss, astrogliosis, demyelination, and infiltration of inflammatory cells (1). Diffusion MR and proton MR spectroscopy findings in the present patient can be interpreted in light of these data. With respect to diffusion MR imaging, ADC maps had detailed data. ADC values in the lesions were high (1.14–1.60 × 10−3 mm2/s) compared with those in normal-appearing brain tissue (0.65–1.00 × 10−3 mm2/s). ADC maps are known to be independent of T2 effects, and these ADC findings of elevated diffusion rates reflect some disintegration of the tissue in the lesions of subacute sclerosing panencephalitis. At the same time, the lesions had subtle high signal intensity on b = 1000 s/mm2 (diffusion-weighted) images, with gradually increasing signal intensity on b = 500 s/mm2 (partially T2-weighted) and b = 50 s/mm2 (T2-weighted) images. Elevated diffusion coefficients on ADC maps with slight high signal intensity on b = 1000 s/mm2 (diffusion-weighted) images is difficult to explain (Fig 2). Such association of these findings may represent a special pattern in subacute sclerosing panencephalitis, and further diffusion MR imaging studies should investigate this in detail. Lee and colleagues (8) reported a different diffusion MR imaging pattern in a recent study of acute encephalitis associated with measles infection; the lesion patterns were consistent with those of cytotoxic edema and were associated with “acute infection.” The current patient had subacute sclerosing panencephalitis. Several previous proton MR spectroscopy studies on subacute sclerosing panencephalitis reported markedly decreased NAA peaks. Also, increases in Cho and myo-inositol and the presence of lactate were noted (5–7). NAA decrease was attributed to neuronal loss, myo-inositol increase to active gliosis, choline increase to demyelination, and the presence of lactate to macrophagic infiltration (5). Spectroscopy findings in the present patient were different except for marked NAA decrease. All major peaks including Cho, Cr, and myo-inositol were normal in multiple voxels from lesion sites in both hemispheres in the presence of prominent NAA decrease. 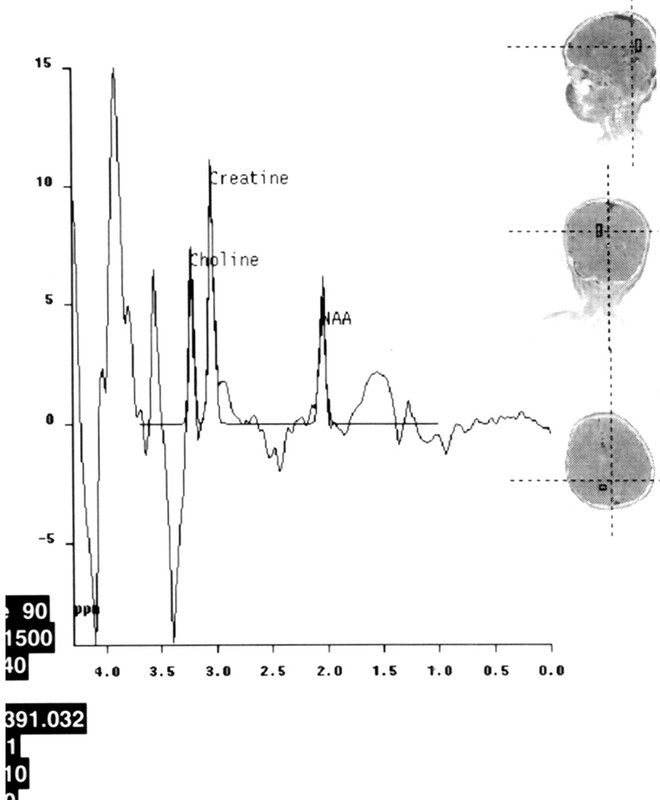 Only some irregular peaks at 1.0–1.5 ppm were evident, which may have represented macromolecules (Fig 3). On the basis of these spectroscopy findings, it can be concluded that severe loss of neurons (marked NAA decrease) was evident in the present patient. In light of the fact that other peaks (Cho, Cr, and myo-inositol) were normal, a relatively slow evolution of the disease can be considered when comparing spectroscopic data of the current case with those previously reported (5–7). Correlating spectroscopic with diffusion MR imaging findings, it may be suggested that the elevated diffusion pattern mainly reflected neuronal loss in this patient with subacute sclerosing panencephalitis. Accepted after revision August 26, 2003.